INTRODUCTION: Safe access to the peritoneal cavity is paramount for success of the NOTES procedures. We have recently described a PEG-like approach and pneumoperitoneum-assisted translumenal access to the peritoneal cavity. 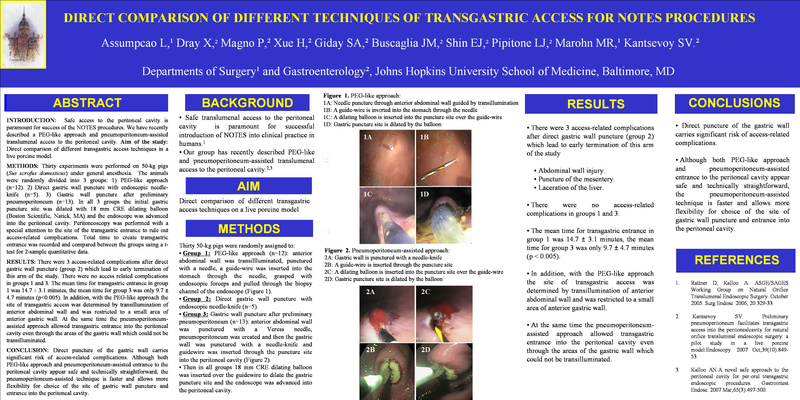 Aim of the study: Direct comparison of different transgastric access techniques in a live porcine model. METHODS: Fifteen experiments were performed on 50-kg pigs (Sus scrofus domesticus) under general anesthesia. The animals were divided into 2 groups: 1) five animals with PEG-like approach (anterior abdominal wall was transilluminated, punctured with a needle, guidewire was inserted into the stomach through the needle, grasped with endoscopic forceps and pulled through the biopsy channel of the endoscope) and 2) ten animals with pneumoperitoneum-assisted approach (anterior abdominal wall was punctured with a Veress needle, pneumoperitoneum was created and gastric wall was punctured with a needle-knife and guidewire was inserted through the puncture site into the peritoneal cavity). Then in both groups 18mm CRE dilating balloon (Boston Scientific , Natick, MA) was inserted over the guidewire to dilate the abdominal wall and the endoscope was advanced into the peritoneal cavity. Peritoneoscopy was performed with a special attention to the site of transgastric entrance to rule out access-related complications. Total time to create transgastric entrance was recorded and compared between both groups using a t-test for 2-sample quantitative data. RESULTS: There was no access-related complications found inside the peritoneal cavity in both groups of animals and the total time for translumenal access did not differ significantly (p=0.124) between the PEG-like and pneumoperitoneum-assisted approach. Nevertheless, with the PEG-like approach the site of transgastric access was determined by transillumination of anterior abdominal wall and was restricted to a small area of anterior gastric wall. At the same time the pneumoperitoneum-assisted approach allowed transgastric entrance into the peritoneum even through the areas of the gastric wall which could not be transilluminated. CONCLUSION: Although both PEG-like approach and pneumoperitoneum-assisted entrance to the peritoneal cavity appear equally safe and technically straightforward, the pneumoperitoneum-assisted technique allows more flexibility for choice of the site of gastric wall puncture and entrance into the peritoneal cavity.